The #1 DOT Driver Qualification Program. 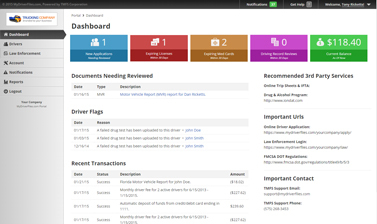 Shown above, the account dashboard allows you to quickly see important information such as upcoming annual reviews, non-compliant drivers, recent transactions and more! 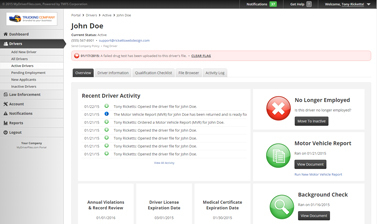 Are you looking for an better, cheaper and more efficient way to manage the DOT Driver Qualification Files for your drivers? If so, you're in the right place! 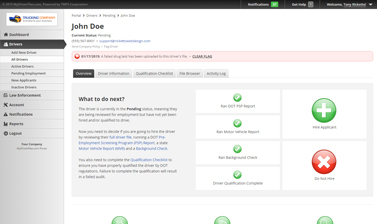 Our web-based software, MyDriverFiles.com, makes driver qualification files easier than ever! Our program will guide you through DOT qualifications for each driver, allowing you to complete the required files online via electronic forms or manually upload copies of your current forms. The driver qualification doesn't stop after the initial requirements are met. Our system will keep track of when your driver's licenses and medical cards expire, when annual record reviews are due and assist in making sure your driver's stay qualified and compliant with DOT regulations. View Pricing Sign Up Now! Fully Guided Making Qualification Easy! The driver qualification requirements are confusing and time consuming. When you use MyDriverFiles.com, we guide you every step of the way by providing instructions on what to do next. Our interface is very simple to use and allows you to easily see what has been completed and what still needs your attention. We also provide guidance on more than just DOT qualification requirements. The days of hiring multiple companies to obtain documents such as Pre-Employment Screening Program (PSP) Reports and Motor Vehicle Reports (MVR) are finally over! We provide all these documents for you directly in the program! Shown above is the pending driver overview for a specific driver. From here, you can easily see what items are yet to be completed. We provide good direction and an easy interface, which makes driver file management simple! View FAQ's Sign Up Now! Shown above is the active driver overview for a specific driver. This view allows you to quickly see important dates such as annual reviews and expirations. Don't worry about remembering them because we'll remind you! Automatic Annual Reviews & Reminders! When dealing with DOT driver qualifications, there are several tasks to be executed on an ongoing basis, such as annual driving record reviews, driver license expirations and medical card expirations. Accidentally missing these important dates will cause your drivers to be disqualified to drive. When you sign up for MyDriverFiles.com, we make sure you never miss a crucial date again! With features such as expiration date reminders and automatic execution of annual violations and driving record reviews, you can rest easy knowing that we take care of ongoing tasks and reminders.